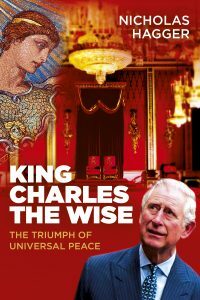 In King Charles the Wise, Nicholas Hagger celebrates the UK’s post-Brexit global destiny and foresees the birth of a united world. Following the tradition of Ben Jonson’s 17th-century celebratory court masques in verse and his own The Dream of Europa (which celebrated 70 years of peace in Europe), and incorporating the blend of mythology and history and five sections (prologue, antimasque, masque, revels and epilogue) found in all masques, he describes how Zeus sends Minerva, goddess of Wisdom, as an ambassador to Prince Charles in Buckingham Palace. Zeus wants a democratic World State to end all wars, as called for by Truman, Einstein, Churchill, Eisenhower, Gandhi, Russell, J.F. Kennedy and Gorbachev. He sees the innovative and influential UK as best placed to give this humanitarian vision global prominence, and seeks the support of its future King, Charles, deeming him more enduring and open-minded than its transient, partisan politicians. Minerva confronts Prince Charles with the conflicting perspectives of the goddesses Britannia, Europa and Columbia (who speak for the UK, EU and US), and foresees a World State that will abolish war. He accepts the humanitarian concerns behind this Universalist vision, and Minerva crowns him ‘King Charles the Wise’. Besides being King of the UK and all its faiths he will sympathise with the plight of all humankind and inspire a new world structure that can bring universal peace during the coming Carolingian Age. NICHOLAS HAGGER is the author of 48 books that include works within history, philosophy, literature and international politics and statecraft, most recently World State and World Constitution (2018, both also published by O-Books). As a man of letters he has written over 2,000 poems, two poetic epics, five verse plays, 1,200 short stories and now two masques. His archive of papers and manuscripts is held as a Special Collection in the Albert Sloman Library at the University of Essex. In 2016 he was awarded the Gusi Peace Prize for Literature.